At forecast levels, December&#8217;s seasonally adjusted annual sales rate should rise to 12.3 million units, the highest monthly SAAR of 2010. Auto makers are expected to deliver more than 1,125,000 cars and light trucks during the course of this month’s 27 selling days, giving the U.S. industry a 41,712-unit daily sales rate for December, according to a Ward’s forecast. As projected, this month’s DSR would be the year’s second-highest, representing a 13.8% increase from like-2009, which benefited from 28 selling days. The performance also would mark a 15.1% jump from November, which had 24 selling days. Historically, December tracks as one of the year’s strongest sales months, often reflecting a larger-than-average fleet share. However, with fleet tracking high all year, it’s likely the industry will see a small month-to-month bump in overall fleet sales. At forecast levels, December’s seasonally adjusted annual sales rate should rise to 12.3 million units, the highest monthly SAAR of 2010, and a 1.2 million unit increase over the year-ago SAAR. In line with Ward’s projected December results, light-vehicle sales for 2010 should reach 11.54 million units, a 10.9% improvement over 2009. Even with a lower fleet mix, General Motors Co. and Ford Motor Co. should see a significant month-to-month DSR boost, lifting Detroit auto makers’ market share to 45% for December. Ward’s is calling for GM to grab 20.1% of the market on daily sales of 8,383, a 13.6% increase from year-ago, while Ford is expected to account for 16.9% of LV sales with a 12.6% DSR hike. Chrysler Group LLC’s projected 8% market share reflects an 8.9% DSR improvement over year-ago. 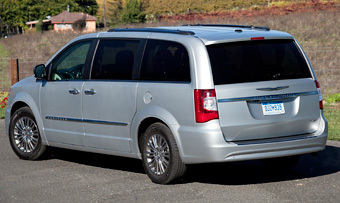 Look for the company to push sales of its core-brand Town & Country to ensure its spot as the top-selling minivan in 2010. The T&C has been neck-and-neck much of the year with the Honda Odyssey, which is redesigned for ’11. Toyota Motor Sales U.S.A. Inc. had a weaker-than-expected November DSR, but could make up some of that ground with increased activity in the fleet market and a continued incentive push. Ward’s forecast calls for a Toyota DSR or 6,197, 7.6% lower than year-ago, but good for a 14.9% share, equal to its November share. American Honda Motor Co. Inc. is expected to show a 12.2% DSR hike for a 10.3% share. Some 5,000 units separate Hyundai Group and Nissan North America Inc., the market’s sixth- and seventh-largest new-vehicle sellers, going into December. The Ward’s forecast, which calls for Hyundai and Nissan to claim monthly shares of 7.5% and 7.8%, respectively, would leave them in a virtual dead heat. However, there’s the potential for either company to dramatically alter the equation with increased marketing and incentive activity through the end of the month. The forecast SAAR stands nearly even with the prior two months, lifting the Q4 SAAR to slightly above 12.2 million units and signifying a new baseline sales level in contrast to the 11.3 million units SAAR for the first three quarter of the year.